Debbie S. submitted this photo and caption. 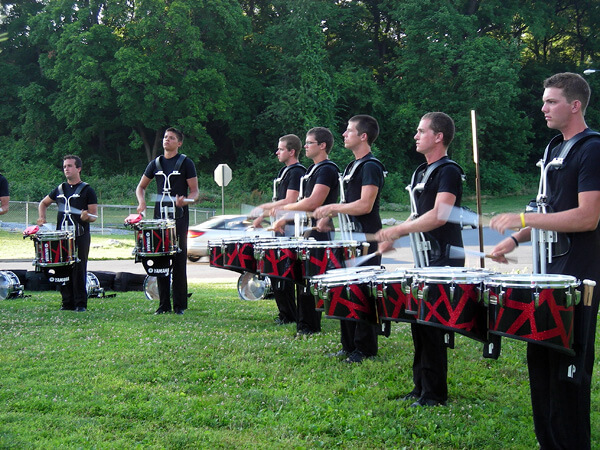 This is a photo I took when the Cavaliers drum line was warming up in Cedar Creek Park, Allentown Pa., before a performance at J. Birney Crum Stadium in June of 2010. My son Austin's college roommate, Matt is third from the left. I've been a big fan of drum corps since Austin, a drummer, was in his high school marching band. His director, who was active in the Bushwackers of DCA, would arrange for groups of his students and band parents to attend DCI and DCA shows in the summer. Austin went on to play in his college band at Millersville University of Pennsylvania, and we were excited when Matt, who is also in the MU band, auditioned and made the Cavaliers. It has been a lot of fun following the Cavs! They were amazing in 2010 and I look forward to the 2011 season, since Matt will be marching with them again next year.